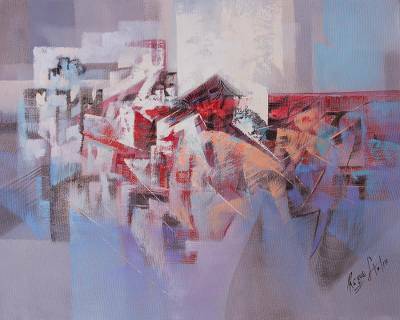 Signed Angular Abstract Painting from Peru, "Urban Forms II"
Working with tones of red, peach, and pink, Peruvian artist Teodoro Reque Liza creates a modern abstract composition. Geometric and organic forms dance together in a whirlwind of motion. The artist draws inspiration from urban landscapes. Titled Formas urbanas in Spanish.